Security experts and IT managers have long warned against using the same password on multiple sites, yet many users continue to do just that. And while it’s easy to dismiss this practice as mere habit, there is more to it than that. The sheer complexity of managing so many passwords and keeping track of multiple usernames is enough to make even the most dedicated techie swear off the internet forever, but there’s a better way to secure your data and keep the bad guys at bay. If the benefits of convenience outweigh security for you, the recent Facebook breach, which exposed the data of an untold number of users, should serve as a wake-up call – and one more reason to use a password manager program. Password managers are designed to keep your data secure in an innovative way. By seamlessly keeping track of usernames and passwords, these valuable pieces of software make it possible to mix things up, all without sacrificing your safety or convenience. But which password managers are worth the price? Here are four of the best and most secure password managers on the market today. LastPass is one of the most popular, secure, and widely used password managers on the market today. The creators of LastPass bring more than three decades of relevant experience to the table, offering millions of customers in over 100 countries extra confidence in the product. Data remains on the device – no data is sent to the LastPass servers, providing an extra layer of security. Built-in two-factor authentication – the gold standard in security. Includes an automatic password generator – If you don’t feel like creating your own secure passwords, LastPass can do it for you. Works on mobile devices – LastPass works on both mobile devices and traditional laptop and desktop computers. Past security vulnerabilities – As one of the most popular password managers, LastPass is no doubt a target for hackers. LastPass suffered from well publicized security vulnerability as recently as March of 2017. While those issues have been addressed, it’s something to keep in mind. Refund issues – Some LastPass users have complained that getting a refund has been difficult. Keepass is another popular and widely used password manager to consider. Keepass is free to use, but it’s also open source and resource light, giving it a leg up on several other password managers. This award winning password manager has been a hit with both individuals and business users, and its security is well known in the industry. Exceptional design and usability – Keepass users can create master passwords that are unique, secure, and accessible only to themselves. Credibility in the industry – The creators of Keepass are widely respected throughout the computer industry. Open source and totally free – the fact that it is free and open source makes it flexible and easy to use. Antiquated website – The design of the Keepass website is anything but modern, and many would-be users may be turned off by its dated appearance. Dashlane is one of the most popular password managers for business use, and one of the most versatile on our list. Dashlane keeps your passwords available online, so you can log on from any device while keeping your credentials safe and secure. Exceptional security – Dashlane meets or exceeds not one but many security standards, making it one of the most secure in the industry. Automatically generates strong passwords – You don’t have to make up your own high-security passwords; Dashlane does it for you. Security alerts – Dashlane users are automatically notified of data breaches and other issues on websites where they have accounts. Easy payments – When you use Dashlane, online shopping is a snap; users can pay online in a matter of seconds, speeding the checkout process and enhancing the convenience of those late-night shopping sprees. Some features only work with Android – If you are an iPhone or Apple user, be aware that some key features, including auto filling forms, may not work with your devices. Designed for business use – Dashlane is a popular choice for business use, and some users feel the software is not geared toward personal users. 1Password includes a number of unique features not found in other password managers, earning it a spot on our list. Automatic password generation – 1Password will create strong passwords for you. Security checks – Known as Watchtower, these automatic security checks are one of the biggest advantages of 1Password. This popular password manager automatically scans for known security vulnerabilities, giving you a heads up on any issues. Multiple platform support – Provided that you don’t use a Windows Phone or Blackberry, chances are 1Password is compatible with it. With support for Windows, Mac and Android, 1Password is one of the most versatile password management programs around. No Windows Phone or Blackberry support – If you are using a Blackberry or Windows Phone, this solution is not for you. No multi-factor authentication – This could be a serious drawback in terms of usability and security. Using a password manager is a good first step, but encrypting Microsoft Word documents allows you to take things one step further. Whether you’re using Microsoft Word for business or pleasure, encrypting your documents is the best way to protect them from prying eyes. Here are the step-by-step instructions you need to secure your Word documents. Choose the Protect Document option. Wait for Protect Document to be highlighted. Choose the appropriate security options, i.e. password needed to open and/or modify the document. Keep in mind that Microsoft will not be able to help you if you forget the password you assign to the document, so be sure to record your password in a safe place. Click Tracked Changes to keep tracked changes on during the review process. Click Comments to prevent others from making changes to your document. Click Read Only to allow readers to review the document but not make changes. Protecting yourself and your data has never been more important. Password managers allow you to create your own secure passwords, keep track of passwords, and even get notified of security breaches. 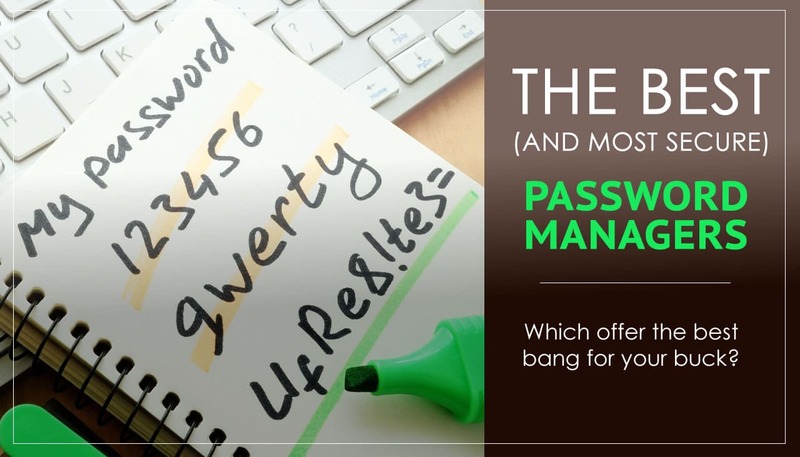 No matter what type of devices you use, we encourage you to review each of these password manager programs in greater detail and select the one that best fits your needs. If you need assistance, we can help you select the best password manager for your business, so feel free to contact Ontech’s support team at 262-522-8560.